Your social media bios are where you introduce yourself to the world, and Instagram gives you a canvas of 150 characters to accomplish this. Until very recently, this was a bit of a gilded cage. Instagram restricted users to mere text, emoji, and hyperlinks, and it wasn’t possible to link to hashtags and other profiles. That’s changed. 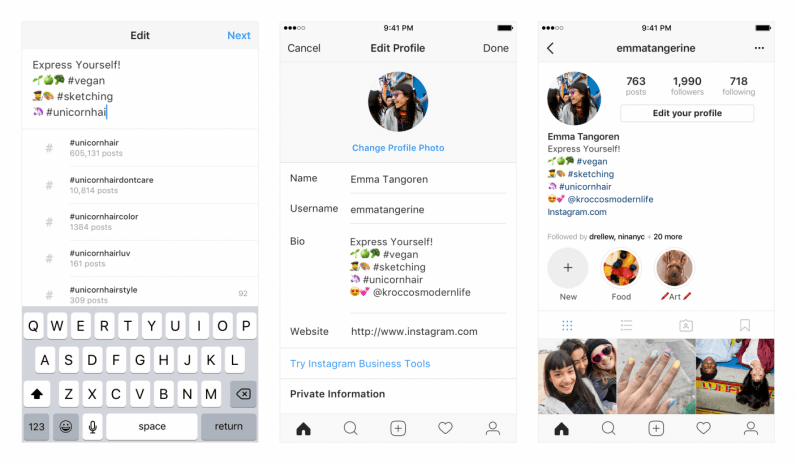 Now, when you edit your profile and include a hashtag, Instagram will automatically turn it into a clickable hyperlink. It’ll also suggest popular and trending hashtags as you type. You can also link to profiles without including the “http://instagram.com/” bit. As you would in a comment, just type “@” followed by the username. Instagram will automatically link to it. The photo-sharing giant also says that when someone links to a user’s profile in their bio, they’ll receive a notification letting them know. Should they wish, they can then choose to disable the link. This change makes Instagram’s bio space much more useful, and follows a number of sought-after improvements to the service. Most recently, the company introduced the ability to follow specific hashtags, in addition to ordinary profiles. Read next: States are competing to get autonomous vehicles on the road — but should they?